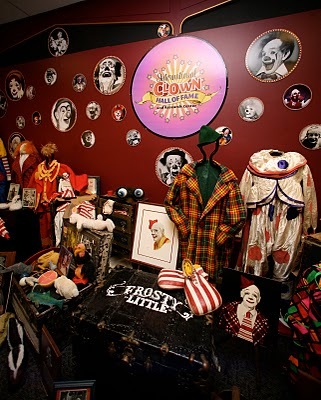 In the unlikely event that you heard, five years ago, that there was a fascinating clown museum — that’s right, a museum and hall of fame about clowns — in the Midwest city of Milwaukee, Wisconsin, I certainly hope you didn’t rush there to see it. That’s because it existed only in packing boxes in a public storage facility. 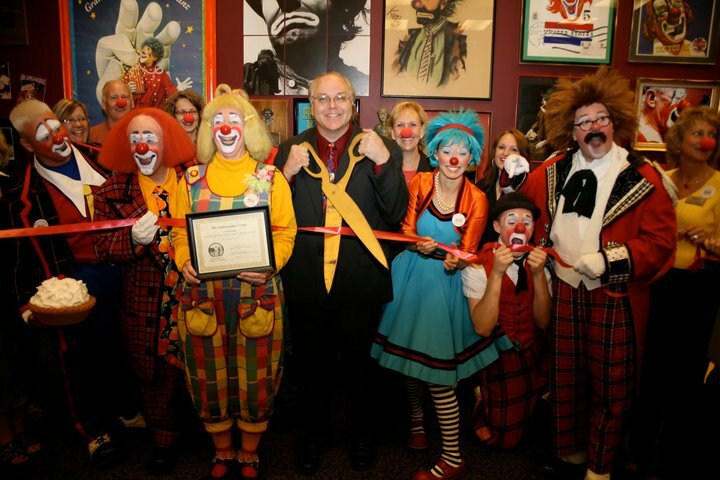 The International Clown Hall of Fame and Research Center, a shrine to the oldest known performing art form, had been booted from its home in the basement of a building at the Wisconsin State Fair Park. Not because the rent was in arrears, but because Wisconsin was one of several states that agreed to house refugees from devastating Hurricane Katrina in New Orleans, far below Wisconsin at the southern end of the Mississippi River. In came the refugees, and into boxes went the museum’s clown paintings and photographs, clown costumes, books on clowning, and videos of famous clowns. And there they stayed until last year. Then the board of directors prevailed upon one of its members — Greg DeSanto, a 25-year veteran professional circus clown who lived with his wife, Karen, also a circus clown — in Baraboo, a little Wisconsin town 188 kilometers (117 miles) to the northwest. But not any little town. 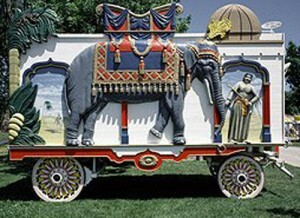 Baraboo is the place where five Ringling Brothers founded their world-famous circus, where one of them built a movie palace downtown, and where the circus’s former attorney founded a spectacular circus museum called Circus World, notable for its brighty-painted rolling tableaus known as circus wagons. The DeSantos had worked there as clowns as well as traveling with the Ringling Bros. Barnum & Bailey Circus. 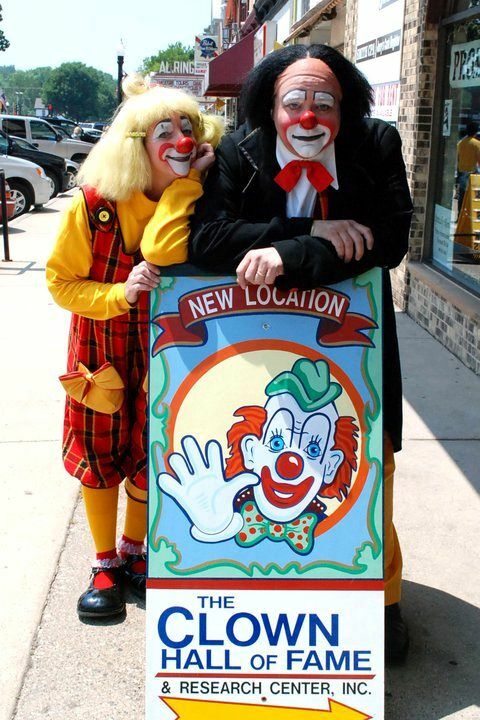 DeSanto found a sweet deal on a storefront site for the International Clown Hall of Fame and Research Center, and over two long trips in the dead of Wisconsin’s brutal winter, volunteers trucked its treasures from Milwaukee to Baraboo in time to open for this new year. Even though it now resides in an obscure town of just 11-thousand people, the clown hall of fame is a museum of international scope. Its exhibits make it clear that in most of the world, clowning involves much more than a silly, greasepainted face, manic gestures, magic tricks, and balloons twisted to look like wiener dogs. One learns there, for instance, that Chinese clowns spend years training as acrobats, learning graceful moves, and perfecting the subtle delights of clowns’ makeup. And that clowns are so revered in parts of Europe that they receive top billing in the circus and enjoy the same prestige as a concert pianist or a ballerina. 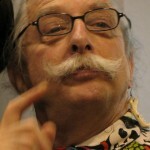 The International Clown Hall of Fame and Research Center maintains an honor roll of more than 50 distinguished clowns, such as the Swiss clown Grock, real name Adrien Wattach. 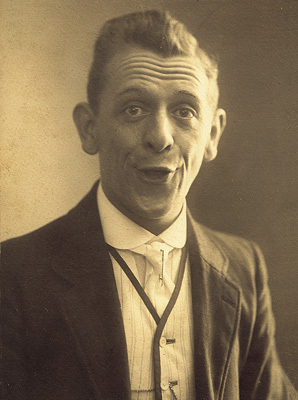 Considered history’s greatest clown, he spoke nine languages and played 27 instruments in performances during the first half of the 20th century. Grock was an “auguste” (pron: OW-goost), which, along with the whiteface clown and the hobo, is one of the three basic kinds of clowns. The auguste, whose largely unpainted face is wildly accented with exaggerated lips and big eyes, is a troublemaker, often teamed with a prim and proper white-face clown. Many American clowns, including Lou Jacobs, the famous Ringling Brothers Circus clown who romped in a midget car — and the museum’s own are a hybrid — are white-faced but silly. Someone once asked Jacobs, “What’s it like to work for a circus for 60 years?” He replied, “It’s hell, honey.” But the broad smile on his face belied that answer. 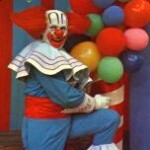 He enjoyed every minute of his life as a clown. 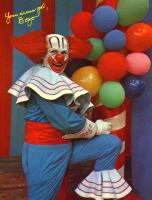 Another famous American clown was Bozo, a red-nosed character with flaming hair and floppy blue shoes. He entertained two generations of Chicago television audiences and was copied in almost 200 other cities. Ronald McDonald, the symbol of the McDonald’s hamburger chain, looks a lot like Bozo. 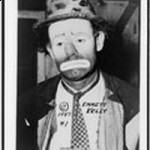 Greg DeSanto says there’s a big difference between an amateur clown who dresses up and performs magic tricks at a birthday party, and a pro like hobo clown legend Emmett Kelly. The amateurs are, almost by definition, part-timers, slapping on makeup and squirting seltzer at audiences for the fun of it and for a little extra spending money. They spend a lot of money on a single costume, and they go to the magic shop and buy a set of magic tricks. They make themselves up, sometimes expertly, but often haphazardly, and wade into an audience of children. And much of the time the children are not impressed. They can spot a clown who’s just going through the motions, doing sthtick. Clowning has to come from the heart, DeSanto insists. “I believe that clowns are born funny,” he says. 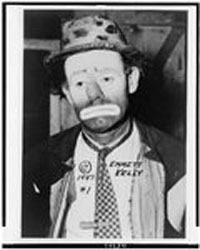 What about the Pagliacci theory about clowns, inspired by the tragic Italian opera about a sad clown and reinforced by Emmett Kelly’s forlorn face and single teardrop? Greg DeSanto says every professional clown he’s known has been anything but laughing on the outside and crying on the inside. Not everyone loves clowns, however. Their bizarre make-up and costumes, and hyperactive movements can scare children, just as tykes sometimes cower when the Easter Bunny, Santa Claus, Barney the Dinosaur, and other larger-than-life characters loom over them up in person. 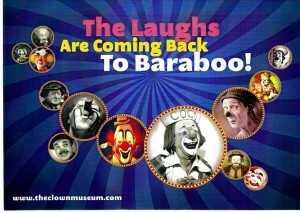 The clown hall of fame gives back to the Baraboo community. It teaches clowning to a diverse mixture of young people — straight-A students, former “at risk” troublemakers, and “special needs” youngsters with learning disabilities — who, together, perform at community functions. 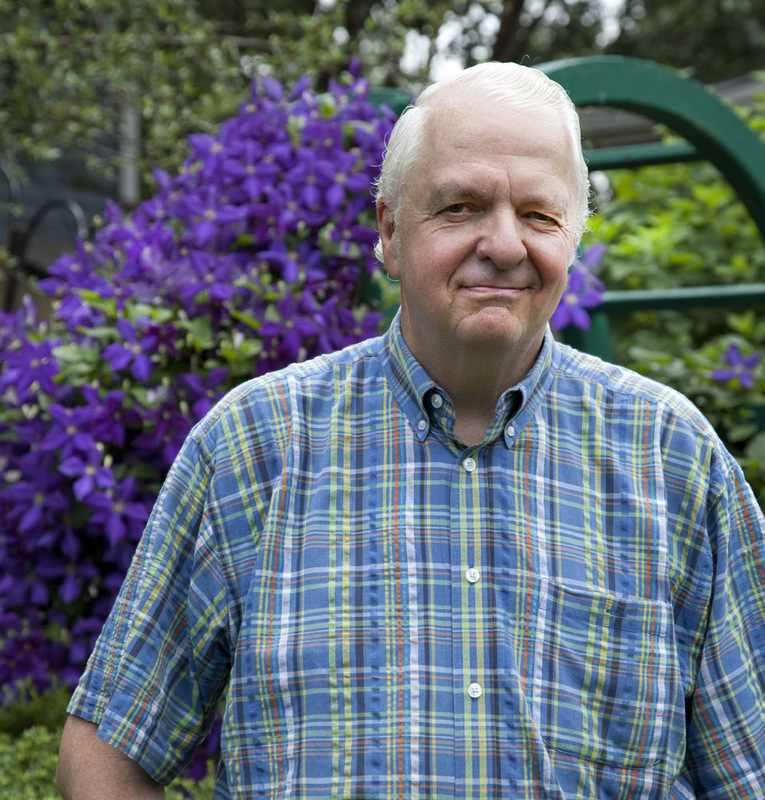 It’s an extension of the belief that “Laughter is the Best Medicine,” espoused in the U.S. magazine Reader’s Digest and echoed in Robin Williams’s hit movie “Patch Adams,” about a clowning medical student who comforts young cancer patients. When I visited the clown hall of fame and museum at its Milwaukee location, I met Tunkle — 54-year-old Korey Thompson — a “therapeutic clown” who some days brought mirth into the world of desperately ill children at Milwaukee’s Children’s Hospital, and others spread joy to disoriented dementia patients at nursing homes. In the antiseptic world of white lab coats, stern faces, suffering and sadness, Tunkle was a rare delight. She was dressed in baggy blue pants, flaming red socks, a loose white shirt, gaudy red scarf. Shocks of blue hair protruded from a bowler hat into which a garish yellow flower has been stuck. Exaggerated red lips and a big red dot on her cheek radiated from her painted white face. 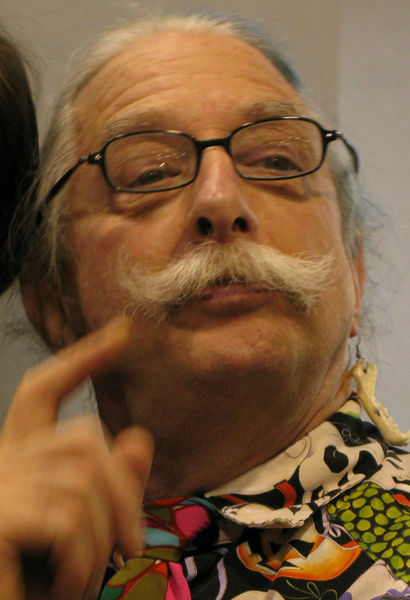 Tunkle, whose work was funded by the clown museum, approached elderly patients gently, pretending to be as shy as they are, then invited them to hug, to play, to make exercise fun for a change. Pretty soon the whole room was laughing, and patients who may have spent all day, every day, staring vacantly were giggling, peeking from behind their purses, reaching to touch Tunkle’s hand. As Korey Thompson’s visits to the institutions demonstrated, the very young and the very old are more alike than different, though the young live in the moment and dementia patients in a world of their own. I also met another amateur clown with a big heart. Bert Berger is a Milwaukee clinical psychologist who works with troubled patients at a medical center for military veterans. 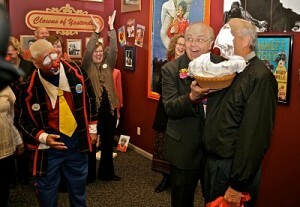 Twenty-five years ago, he learned to juggle, took up clowning, and volunteered at the International Clown Hall of Fame. And he performed before a tough audience. In addition to his professional practice and jobs as a juggling clown, he worked with teenage thugs who had been thrown out of school — and often into jail — for violent behavior. Listening to them strut and curse, they appeared to be beyond society’s reach. But in what he calls the “SELF” program — the letters standing for “self-enhancement through laughter and fun” — Bert Berger met them head-on. So, as you see, there’s more to clowning than clowning around. These are a few words from this posting that you may not know. Each time, I'll tell you a little about them and also place them into a cumulative archive of "Ted's Wild Words" in the right-hand column of the home page. Just click on it there, and if there's another word that you'd like me to explain, just ask! Belie. To misrepresent or give a false impression. Sometimes saying something that belies what’s really going on is unintentional. Forlorn. Pitiful and sad, miserable — or appearing to be such.